Florida might be the hurricane capital of the U.S., but every region has its perils: storms, wildfires, floods and ice. The way we build our homes and prepare for them can make all the difference when they strike. Start by looking at the roof. In dry areas, you want to look for fireproof roofing materials like concrete or slate. In hurricane zones, the shape of your roof can make a difference: wind goes up and over a hip roof, while it can tug a gable roof right off. 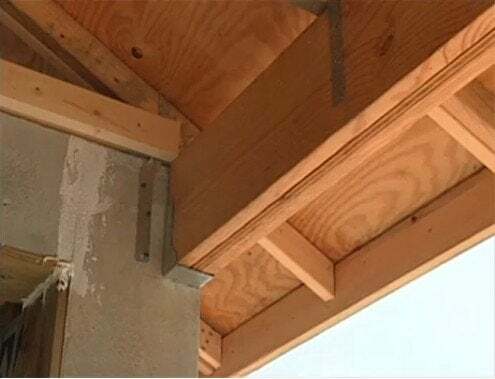 Roof sheathing anywhere should be attached every six inches with ring-shank nails to keep it from lifting, and building codes now often require metal hurricane clips and tiedowns to keep the lid on in high winds. If you’re re-roofing, a waterproof underlayment beneath the shingles can go a long way toward protecting your home from water damage in any weather. The Federal Alliance for Safe Homes, at FLASH.org, has lots of great pointers for strengthening your roof against the elements.